Scooper - Technology News: Asteroid mining: is this the next space race? Asteroids could become big business. At least, a number of governments seem to think so. Last year, the United States passed the Space Act of 2015 , which grants "asteroid resource" and "space resource" to US citizens who acquire the resources themselves. Put another way: if you can get there, you can keep what you find. One of the largest countries in the world might be facing stiff competition from one of the smallest, though, as Luxembourg lays out its own legal framework and investment plans to encourage space miners. The small rocky bodies vary in size and composition, but many may contain coveted metals ranging from nickel to gold, as well as ammonia, which can be used for rocket fuel. 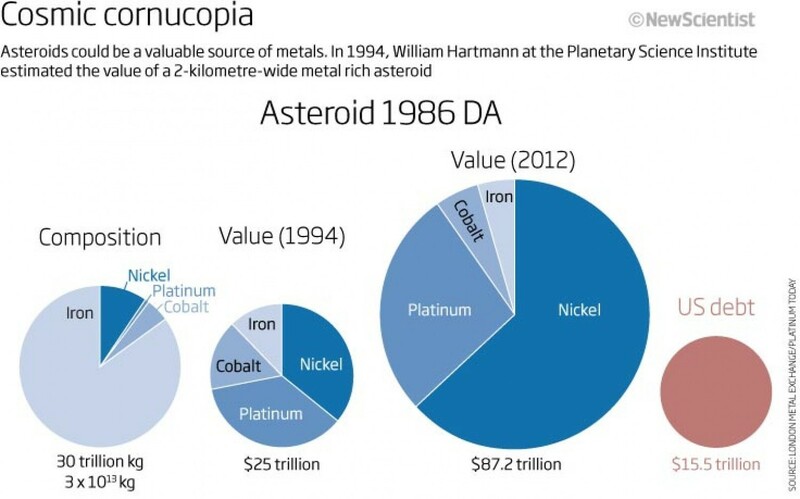 If you can somehow get to an asteroid, the return on investment could be enormous. Mark Sonter, a member of Deep Space Industries, explained to New Scientist that "a typical tonne of asteroidal rock is worth $1 million in orbit – but only $4,000 on Earth. If we can get it in space where we want it to be used, it’s potentially extremely valuable material." Deep Space Industries is in competition with another US company, Planetary Resources, to be the first enterprise to commercially mine an asteroid. Getting to the asteroids might be the biggest challenge, but there are other, more Earthly concerns, as well. Despite all of the enthusiasm from the US and Luxembourg, a 1966 United Nations treaty clearly states that "outer space is not subject to national appropriation by claim of sovereignty, by means of use or occupation, or by any other means". It is yet to be seen if there is any backlash from the international community on these apparent breaches of treaty, or perhaps the temptation of asteroid riches will encourage other countries to join a new commercial space race. Environmental concerns are also already ringing alarm bells. One would think that mining in outer space would be a positive step towards reducing environmental impact, but the mass amount of dust caused by space mining could have a very literal impact . Dust and debris could find its way back to Earth, smashing into satellites and anything, or anyone, orbiting the planet. There is most likely time to find solutions to both of these questions, however. Tim Spahr, director of the asteroid-watching Minor Planet Center in Cambridge, Massachusetts, told the New Scientist that those getting excited about the prospect of mining asteroids had underestimated the difficulty of the task. “I remain sceptical," he said, "but would love to be wrong." Have you read? How can we clean up space debris? Which countries spend the most on space exploration? What does our impact on Earth look like from space?